3. Display - 6.3" IPS display from Shenchao, brightness, contrast, color temperature, sRGB coverage, etc. Xiaomi's success in the smartphone market is underlined by its ability to create well built and good looking smartphones that bring the latest trends in design and performance capabilities, all for a fraction of the price asked by competitors. The Redmi Note 7 Pro is no exception. 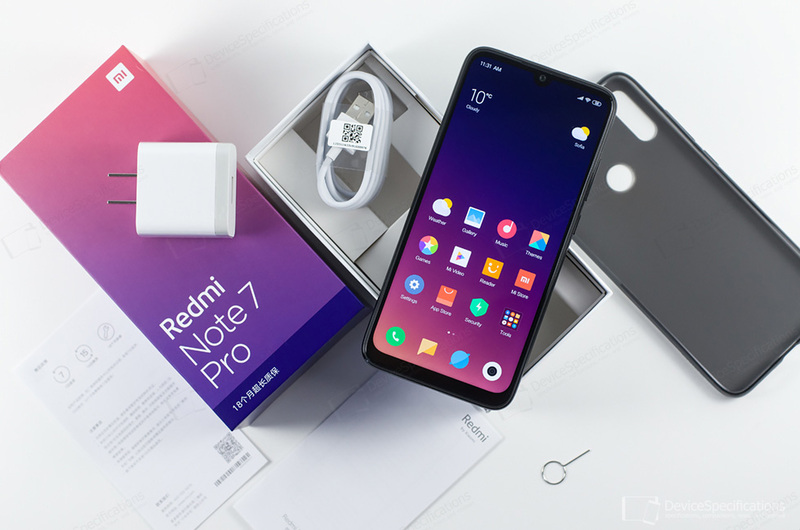 It is identical to the Redmi Note 7 in terms of design, weight and dimensions and shares a number of features and hardware parts with its sibling. However, there are several significant differences, which you can check out in the table below. For a more in-depth look into the Redmi Note 7 Pro, read on the full review. Xiaomi Redmi Note 7 Pro is equipped with a 6.3-inch IPS display with a resolution of 1080 x 2340 pixels. It has a specified typical brightness of 450 cd/m2 and 1500:1 static contrast ratio. The panel covers 84% of the NTSC colour space. The screen is protected by a 2.5D curved Corning Gorilla Glass and has a U-shaped dot notch where you will see the 13MP OmniVision OV13855 front camera with an f/2.0 lens. There's a dual camera module on the glass back aided by a dual LED flash and PDAF. The main camera packs a 48MP Sony IMX586 sensor and a 6-element lens with an f/1.79 aperture, while the auxiliary rear camera uses a 5MP Samsung S5K5E8 sensor with an f/2.0 lens. The model is powered by a 4000 mAh battery paired with a 5V/3A~9V/2A~12V/1.5A fast charger. Performance-wise, Redmi Note 7 Pro relies on a Snapdragon 675 system-on-chip built on Samsung's 11nm process. The CPU consists of eight Kryo 460 cores, two clocked at 2GHz and six - at 1.7GHz. An Adreno 612 GPU manages the graphics department. The double-channel LPDDR4X RAM from Samsung is clocked at 1866MHz and has two variants for this model - 4GB and 6GB. There are two eMMC 5.1 storage versions as well - 64GB and 128GB. Either way, the built-in memory can be expanded with up to 256GB. Redmi Note 7 Pro supports Bluetooth 5, Wi-Fi Hotspot, Wi-Fi Direct, Wi-Fi Display, dual-band Wi-Fi a/b/g/n/ac, LTE Cat. 18 with dual-4G and VoLTE. The device works with the following network bands: 2G GSM (850, 900, 1800, 1900 MHz), 2.5G CDMA 800 MHz, 3G W-CDMA (850, 900, 1900, 2100 MHz), 3G TD-SCDMA (1900, 2000 MHz), 4G LTE (850, 900, 1800, 2100, 2600 MHz), and LTE-TDD (1900, 2000, 2300, 2500, 2600 MHz). There are an infrared port, 3.5 mm jack and a USB Type-C 2.0 with OTG support onboard as well. The Redmi Note 7 Pro supports GPS, GLONASS, and Beidou and runs on MIUI 10.2 based on Android 9 Pie. 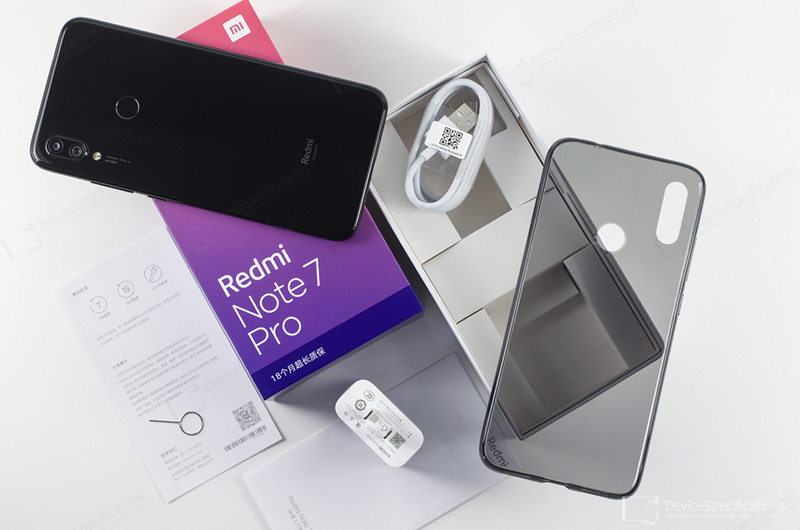 Complete Xiaomi Redmi Note 7 Pro specifications.